Sometimes You is a publisher I’m quite fond of since I was introduced to it back in 2017, as their vision for what a game relies more on the experience than the gameplay per say. The Mooseman is their latest published game for consoles (after a previous indie release on mobile devices and PC), a creation straight out of the mind of Vladimir Beletsky, who was inspired by the myths of his town Perm, and the ancient Chud tribes (a city in Russia near the Ural Mountains). The Mooseman by base is a dreamlike journey that constantly oscillates between myths, storytelling and a hint of riddles to solve, merged into one neat experience. The gameplay is intended to serve the mood of the game and is reduced to its simplest expression, where your character travels in a sidescrolling style world, where you’ll have to help him overcome different puzzles. To do this, you move from the world of the living to the one of the dead with the simple touch of the A button, which changes the perception of the world and thus transforms the scenery to allow you to move forward. For example, if there’s a ditch that prevents you from continuing your way, then you can switch to the world of the dead where a weird looking caterpillar will serve you as a bridge. In short, it is by alternating between realities that you will succeed in finding your way. Other similar mechanics will somewhat enrich the gameplay in the later parts of the game, but always using more or less the same system. In the end, riddles proposed in The Mooseman are clearly not a challenge, meant for people of any age to overcome easily, more focused on learning about this ancient tribe and reach the end of the adventure. Throughout your journey, through Totems, but also hidden marks and symbols, you will discover the Finno-Ugric culture, focused on Komi mythology, deities, and animals from the Perm region (which by the way are endangered and rare species nowadays). And so, the Mooseman allows us to discover the wealth and lore of Komi myths, ranging from the creation of the Earth, of mankind, the existence of the Living world and Underworld, the guards of each different realm and so on. The whole is explained by small smart stories and makes the discovery very easy to understand, but to tell you more about the game would probably spoil some of the discovery to those who will try the adventure. Obviously, the Mooseman is not for all audiences, reserved for those who wish to learn through a game, and don’t expect a complex gameplay or live an incredible storyline. By taking the bold gamble of highlighting an unknown culture through a video game experience (a bit like Mulaka which we reviewed back in February this year), the team brings us back to all that is most common and prodigious in our civilizations, which is telling the story of his people. 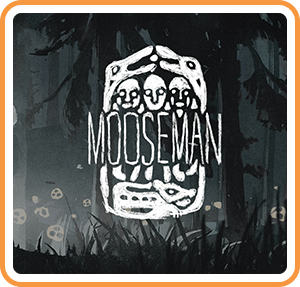 The Mooseman was reviewed using a Nintendo Switch digital download code of the game provided by Sometimes You. The game is also available on PlayStation 4 and Xbox One via digital store releases, as well as previously released on PC in 2017. We don’t discuss review scores with publishers or developers prior to the review being published (click here for more information about our review policy). While not really considered a game per traditional sense, The Mooseman is still a great educational experience that will introduce you to the myth of the ancient Chud tribes.